Fava beans, like edamame, are green-colored legumes that come in their own "pod." You can purchase them canned, fresh or dried. A nutrient-rich legume, fava beans are high in protein and dietary fiber, very low in fat, free of saturated fat and an excellent food source of many nutrients essential for human health, such as vitamins and minerals. Fava beans, when eaten as part of an overall healthy diet, may offer cardiovascular benefits and aid in weight management. According to Fruits and Veggies More Matters, fava beans are a nutrient-dense food, meaning they provide lots of nutrients essential for proper body function without being rich in calories. These beans are a good food source of vitamin B1 or thiamin, iron, copper, phosphorus, potassium and magnesium, meeting 10 to 19 percent of the recommended daily value, or DV, for each per 1/4 cup. Vitamin B1 is important for a nervous system function and energy metabolism; iron is an essential component of a protein responsible for oxygen transport in the bloodstream; and copper, along with iron, helps to form red blood cells. Copper also plays a role in keeping your blood vessels, immune system and bones healthy. Phosphorus and magnesium are important for maintaining strong bones, and magnesium, along with potassium, helps regulate blood pressure. Fava beans are also an excellent food source of folate, and manganese, supplying over 20 percent of the DV for these nutrients per 1/4 cup. Folate supports immune system function, cardiovascular health and helps form red blood cells. Manganese is needed for the metabolism of carbohydrates, proteins and cholesterol. 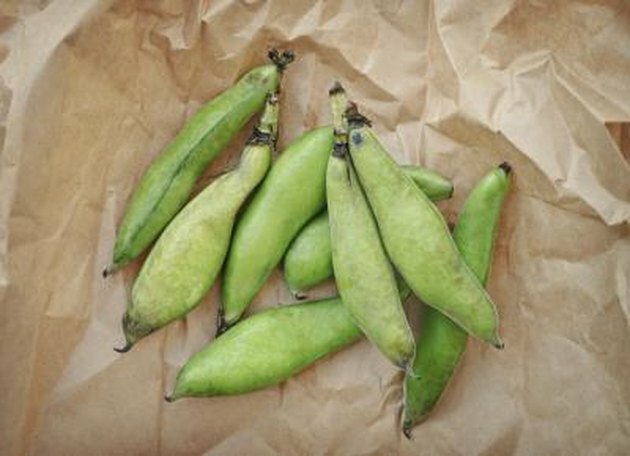 In addition to being an excellent source of nutrients that support cardiovascular health, fava beans are high in dietary fiber, providing 9 g per 1/4 cup. Legumes such as lima beans are a source of both types of dietary fiber, soluble and insoluble, but are particularly rich in soluble fiber. Consuming soluble, fiber-rich foods may help improve your blood sugar and cholesterol levels. Soluble fiber is particularly effective at lowering low-density lipoprotein (LDL) cholesterol levels, commonly referred to as "bad" cholesterol. Fava beans are also high in protein, offering 10 g per 1/4-cup serving. According to a study published in 2010 in the "European Journal of Clinical Nutrition," overweight or obese individuals who followed a calorie-controlled, high-protein, high-fiber diet lost more weight than those on a standard calorie-controlled, high-carbohydrate, low-fat diet. Participants included 89 overweight or obese women aged 18 to 65 years, who followed their diets for 10 weeks. Participants on the high-protein, high-fiber diet not only lost more body weight and total fat, but they also enjoyed lower total cholesterol and LDL cholesterol levels. With their combined protein and fiber content, fava beans can help with weight loss.